It’s 9 pm and I’m bombed out from a 3 am rise for a run to the airport this morning. Musing on what I can write before I nod off completely, something is tickling my ear. Mrs Wondering Pilgrim is in Wagga Wagga tonight so I know it’s not her. Now it’s the other ear! 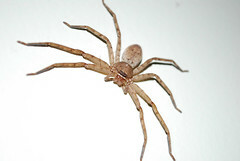 Suddenly it lands on my desk – a Diplocephalus cristatus – or money spider! Oh goody, now I’ll be rich, according to the legend of such creatures. So tiny, little more than 3mm across. Reminds me of this story about money and spiders that pops up from time to time under a variety of guises. An ingenious way of stalling. I am going away to practice my seven-legged spider drawings.